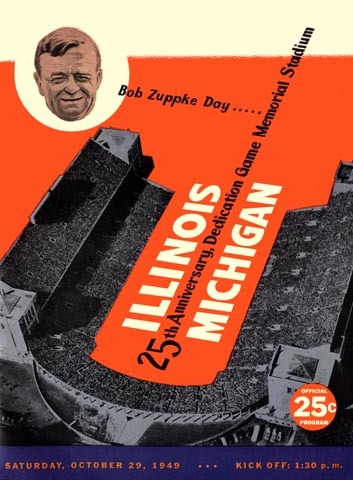 There has never been a game in Illinois history to touch that 1924 stadium dedication in which Red Grange scored four touchdowns in the first quarter and two more after that, as the Illini pulverized the stageshocked Wolverines. On that day the great Bob Zuppke was coaching the blue and orange. Well, that was then. But 25 years later, even on "Zuppke Day," and with Grange himself cheering from the sidelines, it took more than memories to stop the Ann Arbor eleven. And this Illinois crew simply wasn't up to the task.